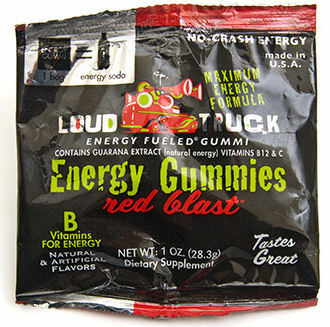 When I learned that I was going to review Loud Truck’s Red Blast Energy Gummies, I was totally jazzed. Since I read Jamie’s review of the Citrus Blast flavor I’ve been itching to try the Red Blast, as I usually prefer berry to citrus. The concept of this candy is a cool idea. Gummi bears that give the caffeine buzz of an energy soda without the crash an hour later? Awesome! And, as I’ve mentioned previously, I find biting the heads off gummi bears to be a lovely form of stress relief, so all in all, this seemed like a dream product. Unfortunately, I ran into some trouble the moment I opened the package. I was overwhelmed by a cloying cherry cough medicine smell that I can only describe as pervasive. And, I was disappointed to find that the gummi bears themselves tasted like the cherry cough medicine my mom used to give me when I was little. They do have kind of a cherry / berry flavor, but it’s followed by a bitter aftertaste. I think all the vitamins that they put in there are hijacking the flavor. Oddly, I found that eating a couple at time, rather than eating them singly, improved the flavor. Overall, the taste wasn’t horrible but it didn’t make me do the happy dance either. On the plus side, the gummi texture was excellent. 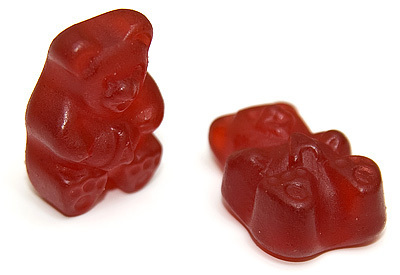 The bears are just the right blend of soft and chewy. Plus, they work as advertised. I went walking for over an hour after I ate them, and had plenty of energy for the whole hike. Also, the gummi bears are a light enough snack that I didn’t have to worry about eating them right before I exercised. As an added bonus, I never got the caffeine jitters like when I drink too much coffee. The gummi bears have other benefits, too. Health food junkies may prefer that the caffeine source is Guarana Extract, touted as the “natural caffeine.” Each serving is only 60 calories and contains all sorts of good stuff like Vitamin C and a bunch of B vitamins. Pretty spectacular for candy! Of course, since this candy is packed with an extra punch, it comes with a warning. For those of you who don’t like to read the fine print: this product is not recommended for children, pregnant women, people with heart conditions, or people sensitive to caffeine or niacin. As always when eating something new, read the label before you try it. Overall, I felt like the pros balanced the cons in this candy. If you don’t mind the cough syrup taste, it makes for an easy, portable energy source that’s fun to eat. 4. Skidsteers often do not have much reach when they are dumping their bucket so you can only load trucks from one side. Skid steers need to drive around the other side of the truck or trailer to load it. The centre of gravity of the load of skidsteers is often kept as close to the skidsteer as possible, this maximizes lift capacity which is particularly crucial when operating from a very short wheelbase, as it cannot handle much weight out the front. Articulated mini loaders can load trailers from one side as they REACH onto the opposite side saving time, diesel and in urban areas you don’t have to venture onto the road, which saves a lot time. This is possible as mini loaders often have more reach than skidsteers, allowing them to work much quicker at filling trailers.